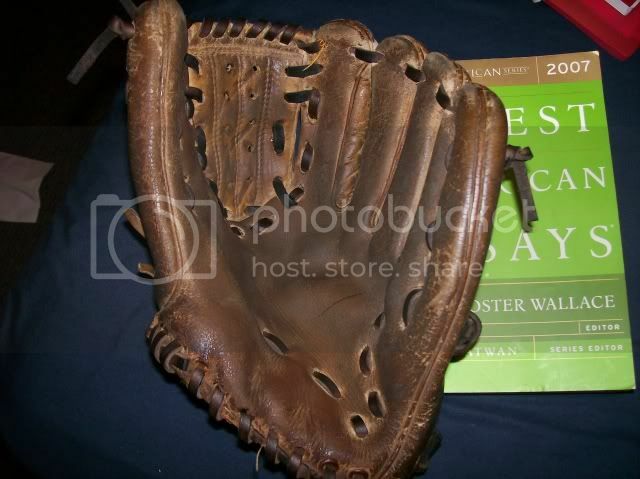 I decided to work on an old glove as practice before I move onto relacing my Rawlings... I posted some pictures of this last week, but here's before and afters. The original lacing pattern had been abandoned long ago so I had some fun coming up with a new one. Thanks goes out to Bret for the laces. 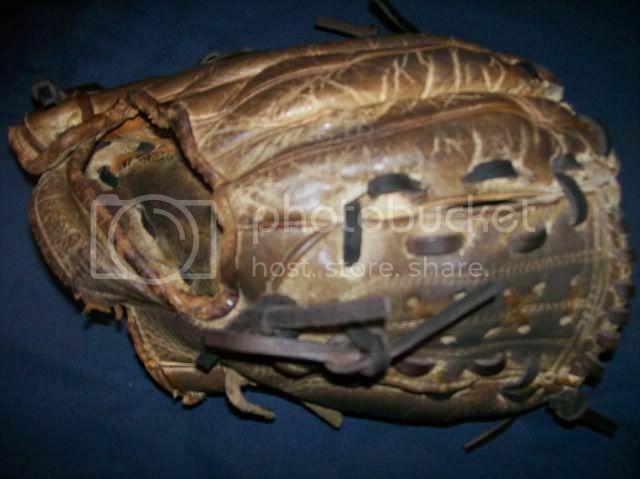 This glove is so much better than what it was before. Basically, I just hit it with tons of Lexol Conditioner and finished with a coat of pure lanolin. looks good, where do you buy pure lanolin and how do you like it compared to other conditioners? check out otc retail as an ebay store. if you use it do not use a lot. instead use a little and really rub it in. initially it will be tacky then within a day or two it becomes soaked in looses the tacky feeling. it does darken slightly so it you really like the color try something else. lexol nf supposedly does a nice job of cleaning/conditioning but i have not tried that. it is next on my list. Tedwilliams94sox wrote: looks good, where do you buy pure lanolin and how do you like it compared to other conditioners? 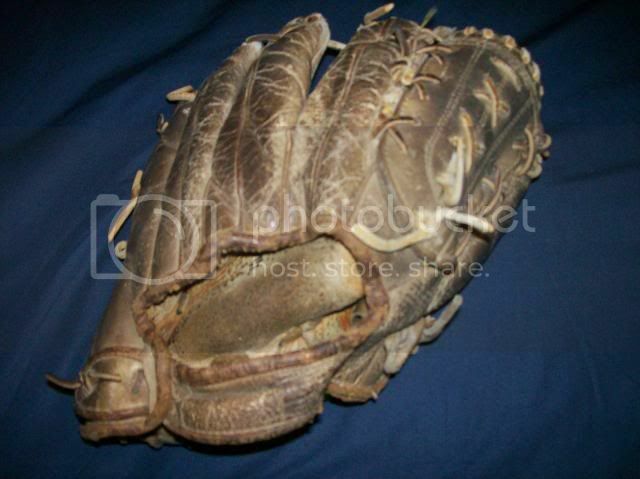 That's where I got the lanolin that I used on this glove. It's $5.89 (plus shipping) for 7 oz of it. I also purchased some "liquid" lanolin from them but I haven't tried that on anything. I've only used Lexol brown bottle conditioner other than lanolin. Personally I like the feel and look of the lanolin better, but I've used a combo of the two on different gloves. Like candlestick said lanolin does get a little tacky until it dries completely, but I didn't notice much of a darkening effect. 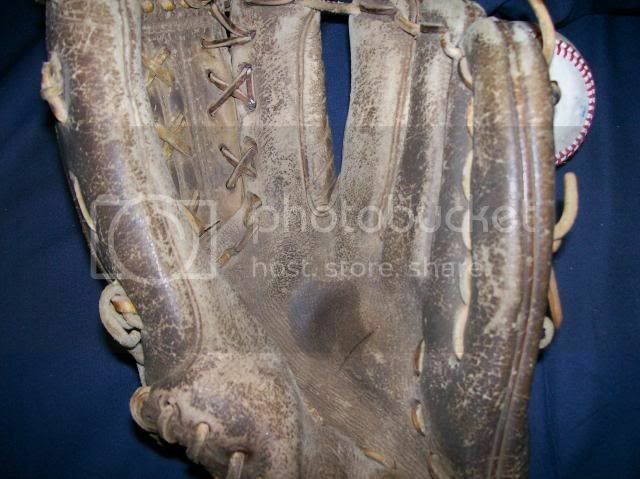 This glove was just so dry (probably went about 40 years without any conditioning) that it darkened as it moistened and it actually took quite a bit. I used lanolin on my tan Gold Glove and it didn't seem to darken it that much, but because the leather wasn't very dry it didn't take near as much. I like to make simple drawings of lace patters (this helps me a lot). If it's a web I'm working on...I like to do one-half of the web while using the other side as a template. Sometimes I have my digital camera handy and will snap about 6 or 8 shots for memory. Great ideas, both of them! I never did the diagram thing, but I I know others on this board have done that. I have used my digital camera more than once. Those chocolate laces look great on it! Good job!